A 30-foot mountain range backdrop. And three plucky Grand Canyon University mechanical engineering juniors, though no partridge in a pear tree. 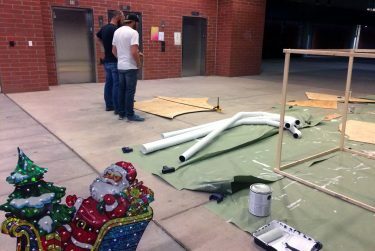 If you were one of the few Thanksgiving stragglers remaining on campus the Tuesday before the long holiday weekend, you might have spied GCU mechanical engineering majors Eric Fisher, Christian Clifton and Matt Furfie, protective eyewear in tow, commandeering a circular saw or two. 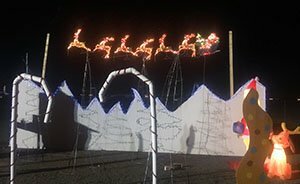 The trio spent more than 12 hours helping bring to life a Whoville-themed Christmas wonderland for the nonprofit group We Are Their Future and its Home for the Holidays light display at Winter Wonderfest. 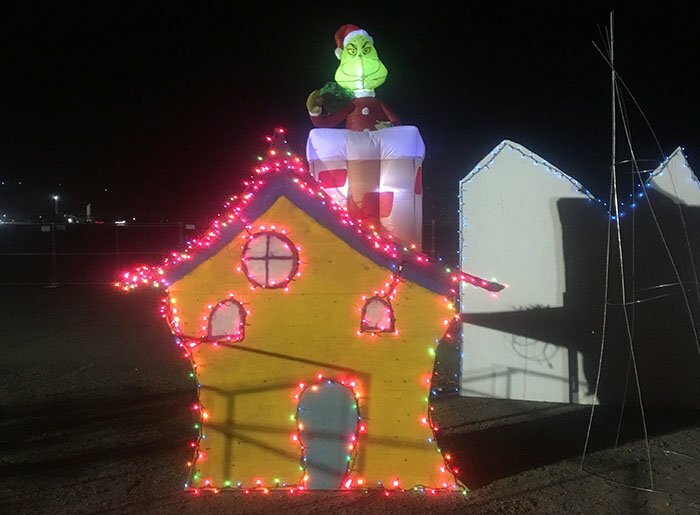 The festival is open from 2 to 10 p.m. Fridays to Sundays through Dec. 24 at Wild Horse Pass Motorsports Park in Chandler, and We Are Their Future was chosen as the official charity for the event, along with group home children. Fisher heard about We Are Their Future through the nonprofit’s CEO and president, Vickie Isaac, who is married to Fisher’s pastor, Steve Isaac of Reunion Community Church in Peoria. Isaac, who is a GCU alumna and former adjunct professor at the University, worked as the director of communications for the Arizona Department of Child Safety before launching We Are Their Future in April. “I resigned that position (with the Arizona DCS) and launched We Are Their Future because I believe the crux is getting them (foster children) into families and that government shouldn’t be parenting children,” Isaac said. She related that a biannual report from the Arizona DCS shows that, from October 2016 to March 2017, more than 5,000 children entered foster care as a result of neglect or abuse and that, as of June 2017, the department reported that more than 16,000 children are in foster care. Also, 50 percent of the children in the foster system remain there for more than a year and 21 percent stay there for more than two years. “The need is urgent,” Isaac told Valley Focus in an Aug. 30, 2017, interview. With so many children in foster care, “You start looking at all the statistics of what happens in group homes and the longer a child’s in foster care, and it’s just terrible,” Fisher said. So he was more than happy to help with the Winter Wonderfest event, and he wrangled a couple of elves in Clifton and Furfie. “I called them up and said, ‘Hey, come help us out. … These guys were kind enough to come out today,” Fisher said. Most days, Clifton, who is a student worker for the engineering college, is busy in the engineering workshops. But he jumped at the chance to step away from the usual engineering project and tackle something for a good cause outside of the classroom. Clifton, who pointed out what will be a Whoville house, said he, Furfie and Fisher are not artists but are getting in touch with their artistic sides to help create the Dr. Seuss-inspired “How the Grinch Stole Christmas” scenery ideas that have been dancing around like sugarplums in Isaac’s head. We Are Their Future supporters will be out at Winter Wonderfest during its six-weekend run — admission is free Dec. 1 — and though the event experienced a “few hiccups” its first weekend, Isaac said organizers have revised and regrouped. The nonprofit’s supporters will be out talking to attendees and hoping people, ultimately, will step up to adopt or become foster parents to children who need a family during a time of year that’s all about family. “It’s for a great cause. It’s a lot of fun to get dirty and make big messes,” Clifton said before giving the team’s Whoville house cut-out a final look. Admission: $20 general admission, $49 VIP access, $69 season pass (additional fees may apply), though admission is free Dec. 1. Children younger than 2 years old do not need a ticket. Some attractions are not included in the admission price. Great job in covering all aspects of the story, Lana! 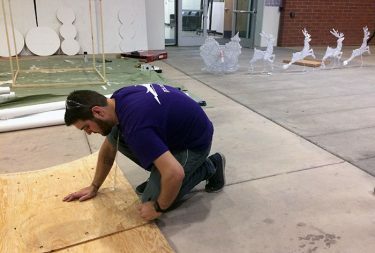 We are grateful for GCU students who care deeply about Arizona’s most vulnerable children, and show it by sharing their time and talent to make a difference for their future! We look forward to growing the relationship between GCU and We Are Their Future because GCU emphasizes solving social injustice as a demonstration of active faith. Students who want to get involved in changing the future for Arizona’s foster children can go to http://www.wearetheirfuture.org for more information and to sign up to volunteer. Thanks again!